When Baby Love Consignment Store started carrying the new BabyKicks pocket diapers, Lauren (the owner of the store), asked if I wanted to try one out. But of course I told her I couldn’t, because I already have far too many diapers. I decided to try the new basic pocket diaper, mostly because she happened to have that one with snaps, and I much prefer snaps to Aplix. And also because the new premium diaper looks weird to me. It has fleece around the legs instead of PUL, which increases airflow and helps prevent rash. But the white edging looks weird to me. 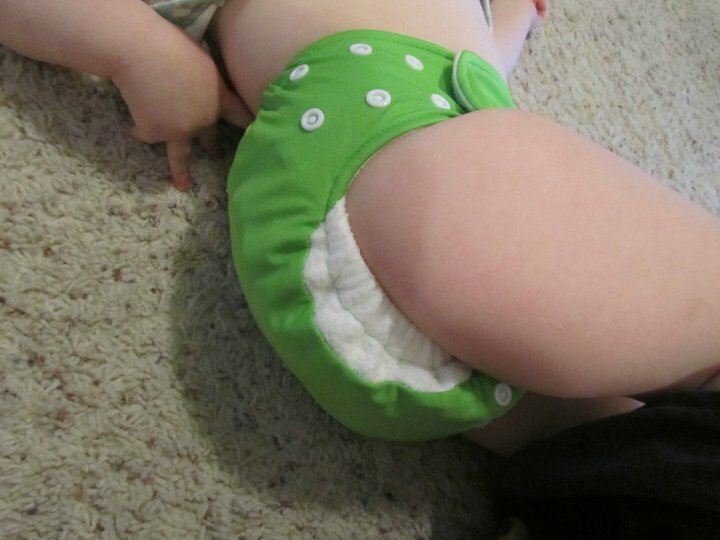 The basic pocket diaper, however, is gorgeous. The first thing I noticed about this diaper is it’s trim. Really, really trim. Side snapping helps, as does the fact that the insert is half hemp and half microfiber. It’s definitely the trimmest one-size diaper I’ve seen. It’s more narrow in the crotch than a Fuzzi Bunz or a Bum Genius, which also makes it trim, but it’s not as narrow as, say, a Daisy Doodle (which I am having to sell all my Daisy Doodles because they are just too narrow to catch pee for a boy), so it doesn’t have a leaking problem. It’s really cute on Teddy. It comes in some great colors, including black (why do I want a black diaper so bad? I have no idea. For some reason black diapers are really doing it for me this year). And as I mentioned, the insert is half hemp, which is pretty much the best combination of absorbency and trimness you can get in a diaper insert. I’ve used it several times, and I’ve left it on long enough to really test it out for pee (which I usually don’t do for my little EC baby, but you know, you gotta sacrifice a little to properly review a diaper), and it’s wonderful. No leaks ever. Except for overnight. It leaked overnight both times I tried it. I should mention that my diaper guru says you shouldn’t use pocket diapers at night for boys or for tummy sleepers, and my boy is a tummy sleeper. So really I shouldn’t expect pocket diapers to work at night. But I have managed to figure out a system with Fuzzi Bunz that works at night. I haven’t tried the BabyKicks with a second hemp insert, which would probably work, but I think the slightly narrow crotch also makes it more likely to leak at night. And it’s so cute and trim anyway, I’d rather keep it as a daytime-only diaper. The one thing I don’t like is the fact that it only has one insert. It’s still pretty trim even with the insert folded over, but since I’m only using it for daytime, the extra absorbency really isn’t necessary, and I’d rather have a shorter insert that fits the smaller size. I could use one of BabyKicks’ lovely Joey Bunz inserts instead, or a Fuzzi Bunz small insert, and I may do that till Teddy is big enough to wear this diaper at the full size. Other than that, it’s one of my favorite diapers. It may become one of my top recommendations for a set of one-size, especially since it’s so trim even on the smaller setting. It is on the smaller size at the largest setting, so I don’t know if it would really fit up to potty training, especially for larger babies. But at $15.99 for a one-size, it’s a great deal. Want to buy one? Head on over to Baby Love and pick it up in person! Oh, you don’t live in Atlanta? Bummer. Well, you can get one here. have you changed your baby’s diaper lately? Fitz is both a boy and a tummy sleeper and pocket diapers are the only thing that works for us overnight! We have both Kawaii’s and BumGenius but prefer the Kawaii’s. However, pocket diapers leaked overnight until he was about 8 months old. So maybe it is also a size thing?